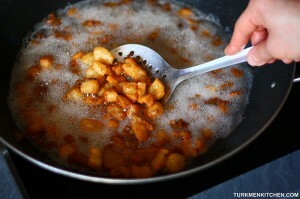 Cracklings, known as jigirdek in Turkmen, are the by-product of rendering animal fat into tallow. 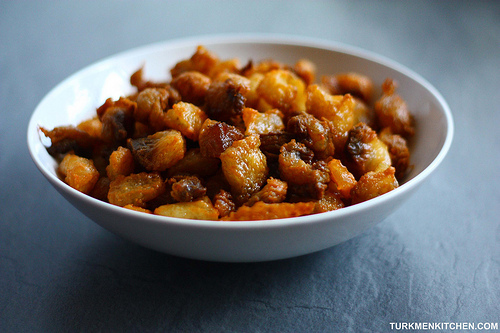 Jigirdek with Turkmen bread makes a great snack but can also be baked into bread. As for tallow, it is an essential ingredient in gowurdak (mutton/beef preserved in tallow). 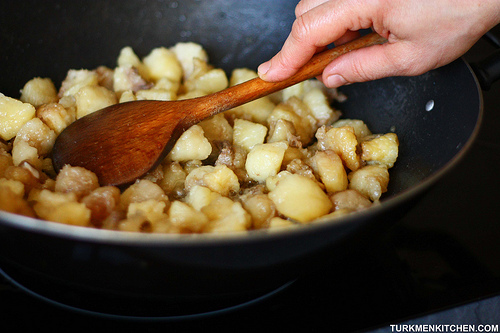 Turkmens also use tallow for cooking eggs, meat and a variety of dishes, such as batyrma. Cut the fat roughly into 2 cm cubes and add salt. Put the cubed fat in a large pot, add water and cook over high heat for 10 minutes, then reduce the heat to medium. Stir occasionally with a wooden spoon. When the water has boiled away, stir constantly so that the cubes don’t stick to the pot. As the fat renders, the cracklings will rise to the surface. Once the cracklings are golden brown, turn off the heat and remove them with a slotted spoon. Store the cracklings in a sealed container. They will keep for several months in a cool place. 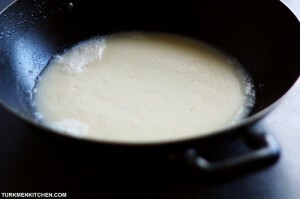 Pour the liquid fat (tallow) into an enamel pot or an airtight glass container. As the tallow cools, it will solidify and become white. Tallow will keep for 4-5 months in a cool place and up to a year in the freezer.